It looks like Chris Pine is going to be Steve Trevor after all. Initially considered a smokescreen, the rumor of him playing a supporting character, even as the love interest for Diana Prince, was thought to be covering his real casting as Hal Jordan in the Green Lantern Corps movie. 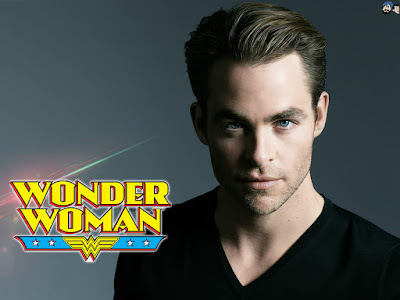 Well, a new report has him signed, sealed and delivered to star as Trevor in the Wonder Woman movie starring Gal Gadot. According to The Wrap it's a done deal. Like many of these comic book movie contracts, Pine's includes multiple films with sequel options. The talented Star Trek actor is in heavy demand with five projects either in production, finished or soon to start. Pine joins Gadot on the Patty Jenkins directed comic book adaption with a scheduled release date of June 23, 2017. Gadot will first appear as Diana Prince/Wonder Woman in the upcoming 2016 release of Zack Snyder's Batman V Superman: Dawn of Justice. I thought Pine was better suited for Hal Jordan, a more affable and congenial character that the chisel-jawed military pilot of Trevor. A role many thought would go to Scott Eastwood. Instead, he's playing an unknown military role in David Ayer's Suicide Squad. Nonetheless, Pine is a good actor whose been plenty busy but has yet to prove to be a draw outside of the Star Trek franchise. This gives him plenty of exposure without having to carry the weight of a blockbuster tentpole movie all on his own.